Angela L. Glover has a B.S in Curriculum and Instruction and Human Development from UNL, an M.A. in Curriculum and Instruction and Museum Studies from UNL, an MA in English from UNO, and a Ph.D. in English from KU. 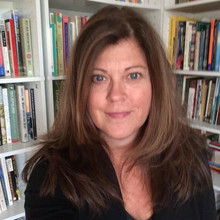 Glover holds a NE teaching certificate and her essays and articles have been published widely in journals and textbooks. Glover served as the Writer in Residence for the Willa Cather Foundation and her children’s book, Ethan Eats Hot Lunch has been nominated for a Golden Sower Award. She lives in Omaha, Nebraska where she teaches online writing. In Glover’s Writers Workshop students identify and apply the six traits of writing to the writing process. While using story mapping and free writing students conceptualize an idea for a story and write, revise, write, revise, workshop in pairs and in groups before sharing their work in small and large groups. Specifically we will focus on character development, showing vs. telling, and descriptive word choice.